My deposit has been paid so one step nearer and I've been getting some serious bike riding time in. First off, three weeks ago I went out for a 120 mile trail ride with the Hertfordshire TRF on a Saturday, this was led by Daniel who I'd done the enduro practice day with and apart from me the only other rider was Mike. He too had been at the enduro day but didn't ride, just popping in to say hello. As both of them were entered in the Beacons Rally the following week, their first ever rally they wanted to get a bit of "practice" in so the pace was fairly brisk and of course the distance big, as trail riding trips with the TRF can be as little as 30 miles long. Although when I met the others at Hatfield, I had already covered 30 miles and ridden three lanes. see, I've been playing with the graphics again... orange this time. We had a great ride and I even discovered a couple of lanes I didn't even know on the Herts/Bucks border and got to ride one that has been on my "to do" list for ages. The ride was long but not without incident as Daniel managed to plant his bike in a hedge at one point. I couldn't even see him when I first stopped, his head was under the front wheel! We got it out eventually! I stayed at a Travel Lodge outside Lancaster and found a nice big signpost to lock the bike to, even better they gave me the room directly above where the bike was parked! Even better, it was still there in the morning! After a short ride to Hest Bank and breakfast at the café, we were allocated to different groups and headed West. We had a good (if slightly damp) morning and although we spent quite a lot of time on tarmac, it was on some fantastic roads through the Forest of Bowland and over Ribblehead and through Widdale. Highlight of the trails was the old road over Salter Fell, where I took my only photo of the 990. If you're thinking this looks familiar, it's because this is where I had my first ride on the 450 last December... the weather was considerably better in August, the sun had come out by now! The afternoon was cut short as on the second lane after the lunch stop in Hawes, a strange noise from the from end made me pull up and discover one of the front brake callipers had shed a couple of bolts, as well as a few other bits!!! A bit of bush engineering ensued, stealing bolts from elsewhere on the bike and a slow and careful ride to Ripon ensued where there is a KTM dealer. Craig who was tail end Charlie for our group came with me to make sure I made it OK. After purchasing the appropriate bits, we retreated to the square in the centre of Ripon, fortified with ice creams from the nearby van and coffees from Café Nero we made more permanent repairs in the sunshine. After a few more back lanes we made it to the stop off at Scotch Corner and later I had a trip by taxi with some fellow riders to an impromptu North Yorkshire and Teesside TRF meeting in Catterick. Here I had a few beers and dinner, discovering a new dish to me, the Chicken Parmo. This is apparently a Teesside speciality consisting of a flattened chicken breast in breadcrumbs and covered in cheese. Surprisingly good it was too! Parmo, or Parmesan, a breaded cutlet dish originating in Middlesbrough, is popular in the North East of England, North Yorkshire and especially in the towns of Stockton-on-Tees, Darlington and Hartlepool. Similar to a schnitzel, it typically consists of deep-fried chicken in bread crumbs topped with a white béchamel sauce and cheese. The next day was spent heading West again along several lanes of a more rural character, i.e. muddy and rutted, until we climbed up onto the North Yorkshire Moors on Rudland Rigg, possibly England's longest unsurfaced road at ten miles long. We then headed to Pickering for lunch. 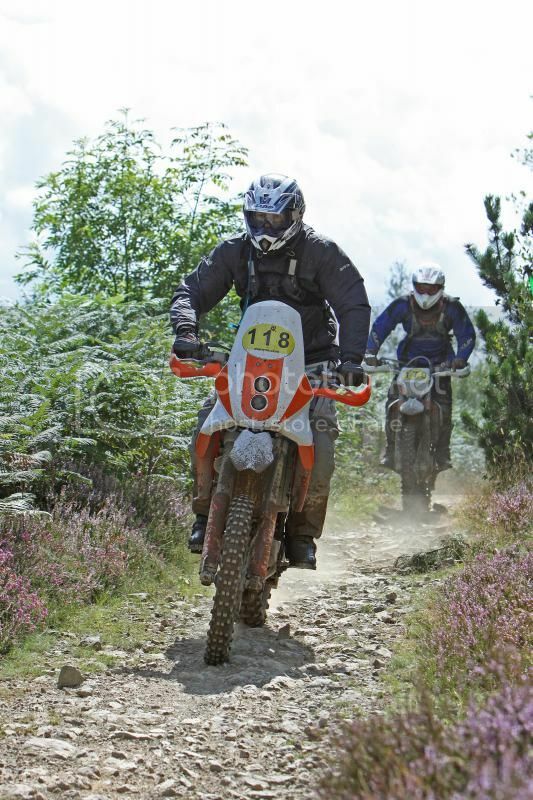 Afterwards we rode into the Langdale and Dalby Forests, all familiar territory from the Ryedale Rally. Unfortunately Craig who was leading that day had a heavy fall and was unable to continue so as it was getting late, I agreed to ride with him back to York where he lives. Once there, I peeled off onto the A64 and started the long trek home. I did it in one stretch all the way to Peterborough Services where I had to stop for some much needed petrol for the bike and caffeine for me! Returning late on the Thursday night meant it was a quick turnaround on Friday and load up the EXC on the trailer for a drive to Mid Wales for the Beacons Rally based near Llandovery. This went well, with no particular incidents and an impressive (for me) 6th place in the Rally Class, in fact my second 6th place in a row after the Ryedale. 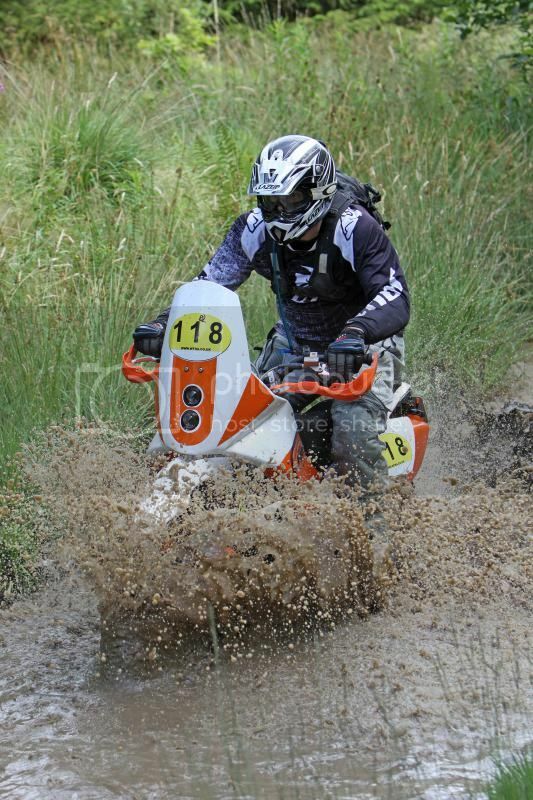 On the whole the weather was good on Saturday with only one very heavy shower at the end of lap one but due to rain over the previous weeks, we did get a little damp! Sunday started off very wet but did improve as the day went on, a pattern that was set in for the following week. Following the Rally I headed over to my friend Rob's house, just over the border into England, along with another friend Jonny who had stayed there for the weekend (all three of us having raced the Rally). Here much jet washing of bikes and kit and washing of loads of filthy gear ensued. Jonny also cooked us all dinner, very good it was too! Monday we headed back into Wales to a campsite at Rhayader where we met up with another couple of mates and the five of us spent the week trail riding throughout Mid Wales. The only significant problem was my trailtech sidestand breaking, so unless I could find a convenient wall or fence post, I was pretty much excused "gate duty" all week.... and believe me the Welsh trails have a lot of gates! Setting up camp... the stand is clearly working here! A stop on the hills on day one , it was shortly after this that my stand broke!!! I had to use the Post Office as a stand! By the end of the week both my front and rear wheel bearings were feeling distinctly second hand not to mention my nice new tyres, fitted only three weeks previously! So a few repairs to do as the side stand needs sorting and the repair I did to the speedo cable didn't last, so new sensor and cable has been purchased and needs to be fitted and new wheel bearings too of course. I have also ordered some new swingarm bearings as they are starting to develop a bit of play. Next planned trip is the Tarrenig Rally in September!